Enhance the appeal of your home interior when you turn to our store for tile flooring. Why not add a durable and attractive surface to your home floor? Whatever you want, modern or traditional, we’ll make sure you find a floor that works with your distinctive design preferences. In addition, we also provide comprehensive tile flooring installation for ceramic, porcelain, and other tile materials. Everything we offer is of the highest quality, yet available at our famously low prices. Longevity - Tile is a more durable, wear-resistant choice for flooring. Ceramic and porcelain tile are well-known for being resilient and long-lasting, especially if cared for properly with non-abrasive, non-acidic products. Variety - You have a huge array of colors and styles to choose from when looking for the right tile. 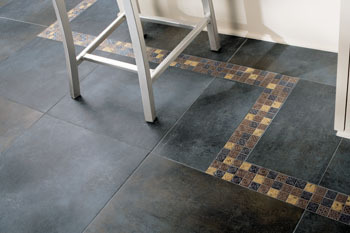 This versatility is one of the key selling points of a tile floor. You can even find tile flooring that looks like wood. With this impressive range of options, including ceramic and porcelain tile, you can be completely confident that tile flooring is the right choice for your home. Make your flooring project truly unique by personalizing it with different tile sizes, shapes, colors, and textures. Easy to Clean - Sealed and glazed tile flooring requires very little maintenance because it stands up well to spills and pet accidents. Many types of grout are also completely stain-resistant. Plus, tile is known to improve indoor air quality, because it does not trap dirt, dust, and dander. Be sure to ask about the wear, fade, and stain warranties that are available on certain products from our store. Turn to the team of tile experts at our store to ensure all of your flooring needs are satisfied. Drawing on the inventory of our network Flooring America stores throughout the nation, we are able to find just about any type of tile you want and offer it to you at the lowest prices available. You can't find affordable tile flooring quite like this at your local hardware store! Our professional associates have the expertise and education to teach you about the many options available for tile flooring and guide you through the entire process, from measurement to the finishing touches. Before we begin the tile flooring installation process, we first measure the length and width of all the rooms we are tiling. Our specialist installers help you find the right style and quantity of floor tiles to make the most of your flooring plan. Our goal is for you to see your design preferences come to life. Our commitment to giving you the best possible service experience does not only cover tile selection. Count on our team for accurate, affordable, and professional tile flooring installation. This is just a small part of our all-inclusive floor services. With our help, you won't have to worry at all about your flooring project. We've got you covered from beginning to end! Contact Syracuse Flooring America for more information about our selection of tile flooring in Syracuse. We proudly serve the communities of Syracuse, Fayetteville, Manlius, Skaneateles, and Cicero, New York.